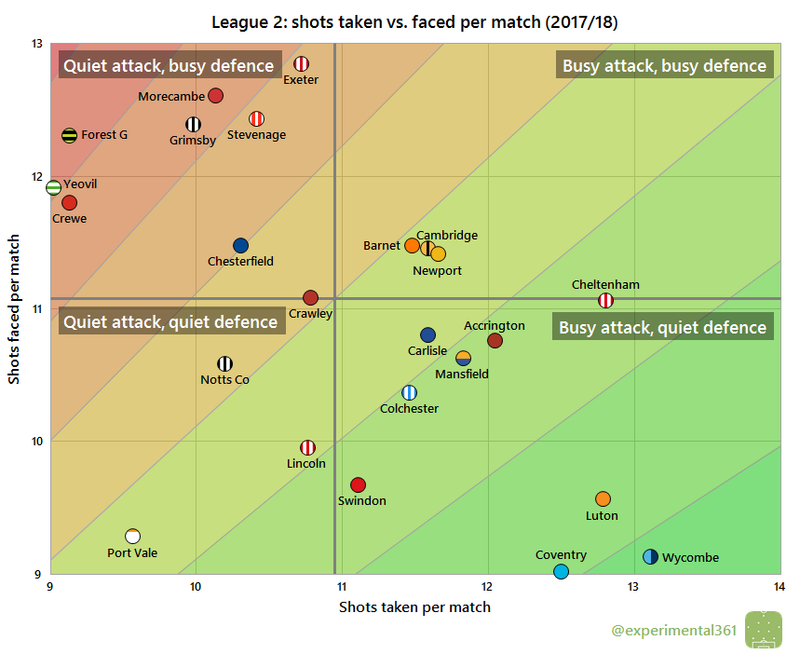 Two of the three automatically-promoted teams – Luton and Wycombe – were pretty dominant overall, but champions Accrington only took around a shot more per game than they allowed. Coventry look a strong side on this evidence, but further down we’ll see a slightly different picture. 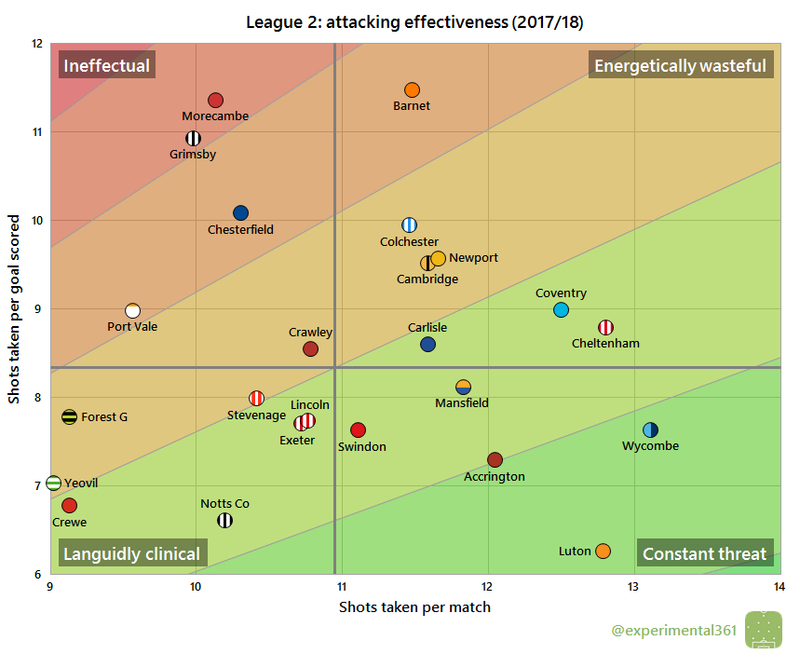 Exeter are a bit of an enigma, having sustained a promotion challenge despite allowing the most shots in the division and not taking all that many – again the charts below will shed some light on this. Luton were unsurprisingly the most clinical finishers in the division – as the regular thumpings they dished out attest – while Barnet would probably have avoided the drop if they’d been less wasteful in front of goal. Yeovil and Crewe look to have made the most of a limited number of chances. Champions Accrington may not have dominated matches but their stubborn defence soaked up a lot of their opponents’ efforts. 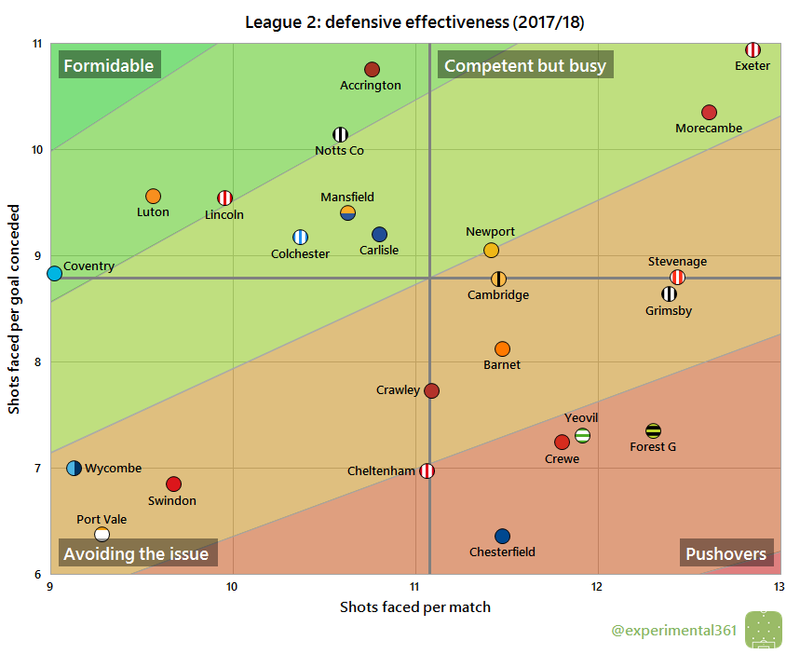 However the most difficult back line to break down was Exeter‘s – along with Morecambe (who have made a tradition of inhabiting the top right of this chart), the Grecians allowed plenty of chances but were able to soak up an impressive proportion of them. Chesterfield‘s relegation meanwhile looks to have had more to do with their ability to repel chances than the number that they conceded. When we correct for chance quality, Coventry no longer look to be in the same company as Luton or Wycombe. Along with Lincoln their defence looks to have been a greater contributor to their play-off finish than their attack, and they might need an upgrade or two up front if they’re to push on next season. 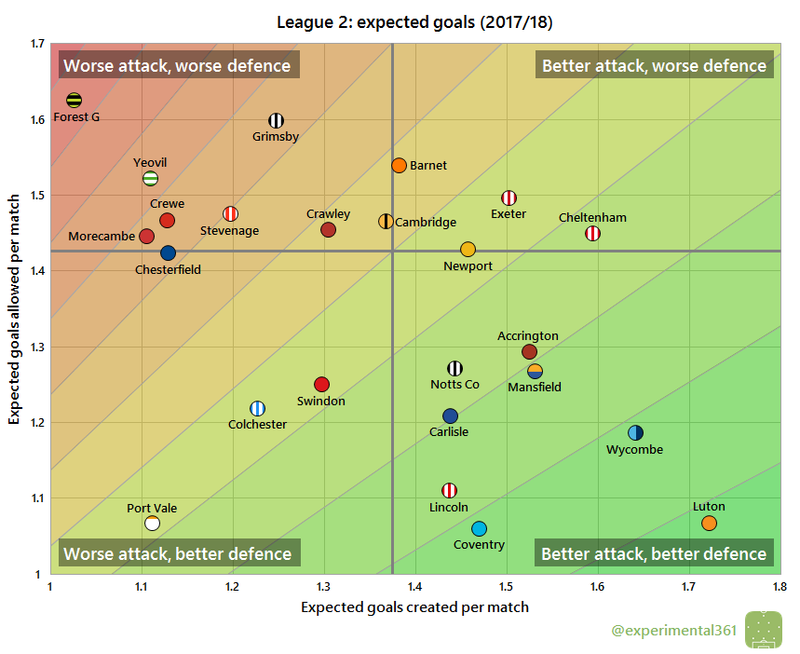 Exeter are the only member of the top seven not in the bottom right quadrant thanks to all those shots they conceded, while relegated Barnet – not too far from the Grecians here – look unfortunate to have gone down. Forest Green meanwhile look to have had a dire debut season, although they have improved since the turn of the year. I hope Port Vale matches are more exciting than this chart makes them look.